Dog roses have always had a special place in my affections, recalling high Summer, deep lanes, tall hedges and the lush meadows of the English countryside. Even people who dismiss wild flowers as weeds recognise the beauty of the wild rose tumbling from the green depths of the hedgerow. There is a wanton extravagance to the wild rose that can produce a profusion of delicate flowers of the softest hue, glowing in the sunlight against the deep shade, even in the most inopportune conditions. I have seen them on quarries, cliffs, railway sidings and even growing out of the shingle at the beach. As I cast my mind back upon other Summers, dog roses appear in all corners of my recollections. I have a treasured copy of W. Keble Martin’s “Concise British Flora,” with his botanical plate of the wild rose upon the jacket, undoubtably the most appreciated page of the book. At primary school we sang Cicely Mary Barker’s “Songs of the Flower Fairies”. My special favourite was the dog rose, “I am the flower that everybody knows, I am the English rose.” Even without pulling my mother’s copy of this book from the shelf, inscribed to her in 1936, “To Valerie, the little girl who loved all the flowers,” I can see the familiar spirit in question. A woman with fine cheek bones and a jaunty regal attitude in a silk dress of rose tint, wearing a garland upon her head fashioned from the golden stamens of a rose, reaching up to caress a cherished bloom. I never questioned how she was able to sit, so confident yet precarious, upon the stem of a briar surrounded by her beloved flowers, because that was the magic of the flower fairies. All these images, memories and emotions come to the forefront of my mind each year when I see the first dog roses of Summer. I stand and take them in for a moment, refreshing the picture in my mind for another year. The commonplace sights of the rural world take on a powerful exoticism in the city and the humble dog roses of Spitalfields are rare phenomena to city dwellers, evoking the entire expanse of countryside that we forget, yet we know exists somewhere far beyond our London streets. There is another dimension to the presence of wild flowers here too, because these flowers remind us of those fields that once were here long ago, where residents of the City of London came to take rural walks and build country mansions, as both Elizabeth and Essex did in Petticoat Lane, and Oliver Cromwell did over in Clerkenwell. 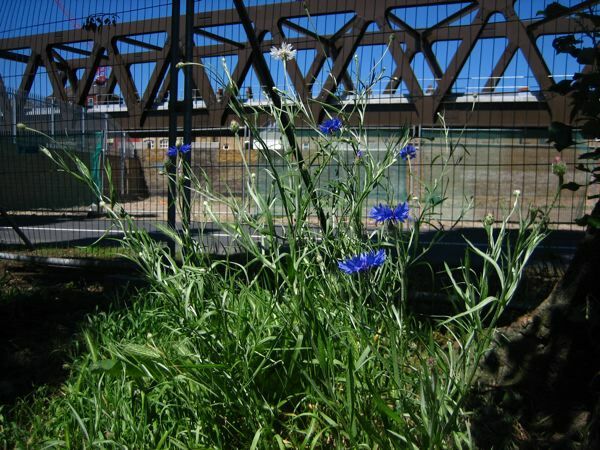 The colourful resurgence of the wild flowers speaks of all the long lost fields that gave Spitalfields its name. 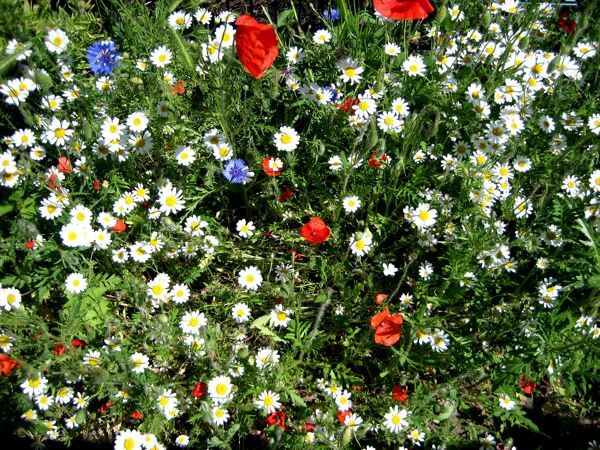 To see these few flowers here is a tantalising illustration of the richness of the meadows before the streets were laid. 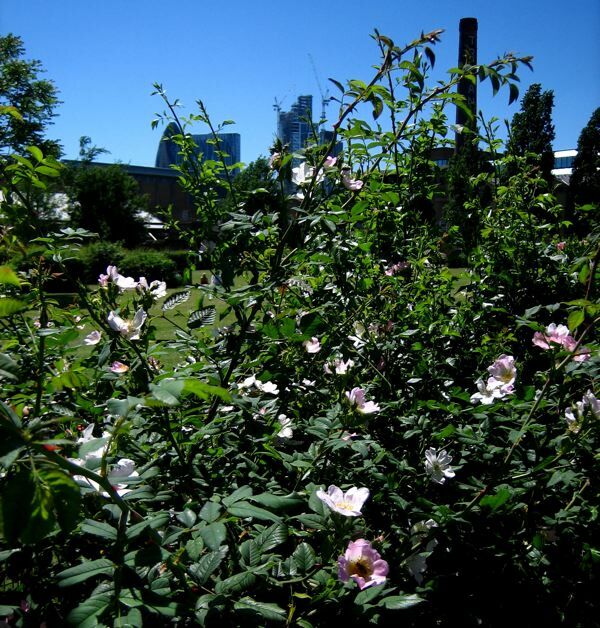 I photographed my dog roses in Allen Gardens, between Brick Lane and the Spitalfields City Farm. This expanse of green now comprises the only field to speak of in Spitalfields, and as I set out on my botany field trip, it was full of sunworshippers, dog walkers, homeless people and alcoholics, all gambolling and disporting themselves upon the lawn in the manner of those shepherds and shepherdesses in the pastoral idylls. Fifty years ago, the site of Allen Gardens was mostly streets and houses, though I believe there was a paddock for the dray horses from the brewery on this site. Today we are all thankful for this small patch of green that has been restored to us, though I wonder if perhaps the reason the wild flowers grow here is because some guerilla gardeners scattered seeds. It feels shameful now to admit that my mother used to take me for walks through the fields in Devon to pick wild flowers when I was a child, though particular bunches remain vivid to me, and I shall carry them always in my mind’s eye, even years after the posies themselves have wilted away to nothing. I think of those bunches of celandines I picked on the banks of the River Exe, the primroses and violets at Chard, and harebells at Corfe Castle, especially. Although picking wild flowers might be seen as ecological vandalism today, it did ensure I learnt all the names, and somewhere I have an album of pressed specimens all carefully labelled with their species. 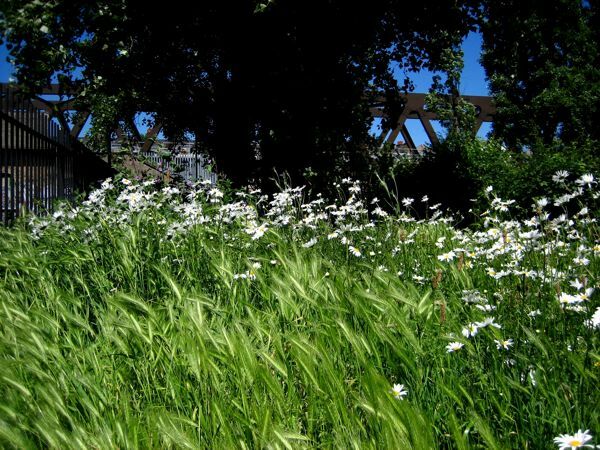 So, as I walked around Allen Gardens, I was proud to recognise buttercups, cornflowers, field poppies, ox-eye daisies, camomile, vetch, clover, white and pink campions, scabious, yarrow and herb robert, among many others that are extraordinary for a city park. I did not pick them, I photographed them for you instead. When I walked with my mother along the cliff path outside Weymouth, learning the names of the flowers, I never expected I should use the knowledge in London, but I am especially grateful to know their names now, because recognising the different species of plants keeps me in touch with the greater landscape beyond our urban enclave.